Undergraduate (cadet) training is provided as work based, practical training together with in-house technical seminars and mentoring. A graduate development opportunity exists, known as the “Wombat” program, whereby candidates can gain experience in a different office location working on new projects with a different team, and is available to those interested. Cadet and graduate training is geared to achieving associate membership of the AIQS and/or RICS. 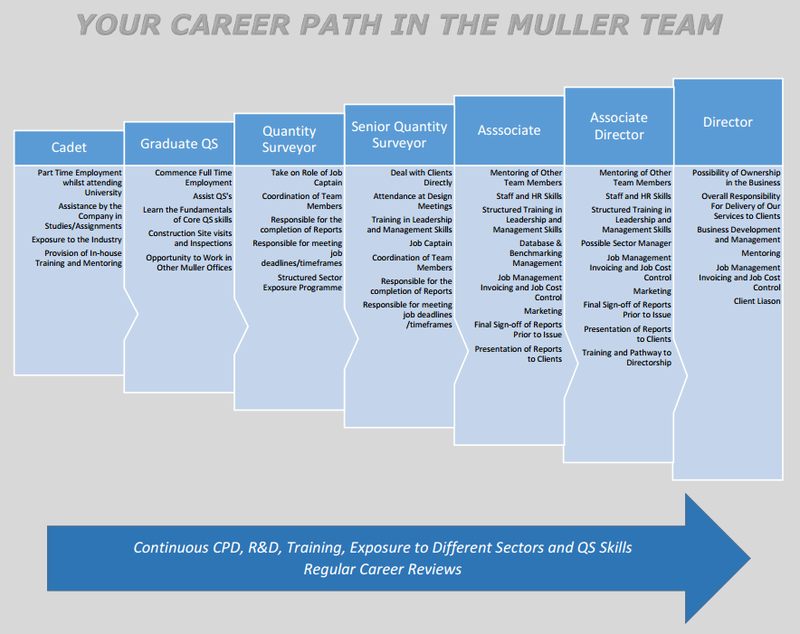 Muller Partnership offers variety through a wide selection of experience in multiple industry sectors, project sizes and service delivery. As a medium sized company everyone will know your name and office managers, associates and directors are readily available to discuss any concerns or ideas you may have. Selected leadership candidates embark on a management, leadership and personal development program over two years. Candidates relocating from overseas are given assistance with visas, relocation, temporary accommodation and settling in to their new country. All offices are modern with all essential staff facilities. Taking care of our staff through clear career progression, professional development, a team environment and incentives, is our goal.